At Rico Gloves we have developed our conditioner to aid in breaking in your new glove, or to restore the appearance and supple feel of your favorite already broken in while maintaining a dry-to-the-touch feel. 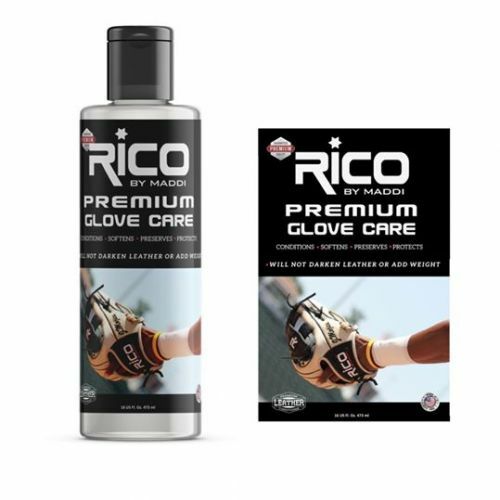 Rico Glove Care and Conditioner is formulated with Vitamin E to breathe new life into your glove or batting gloves. Rico Glove Care is formulated with UV protection to resist cracking, fading, and discoloration caused by harmful solar rays. Works excellent on all the new high quality leathers, leatherette, and faux leather gloves. Penetrates deep into the leather for the softest feel on any leather surface. Natural cleaning abilities remove light stains from the surface. Restores the natural leather scent back to your glove. Prevents your original leather from becoming dry, aged, and cracked. Treat your glove right with Rico Glove Care and Conditioner!